Central University of Orissa invited applications from eligible candidates for 65 Faculty Posts. Eligible and Interested candidates can send their application in the prescribed format along with required copies of documents on or before 30 November 2016. 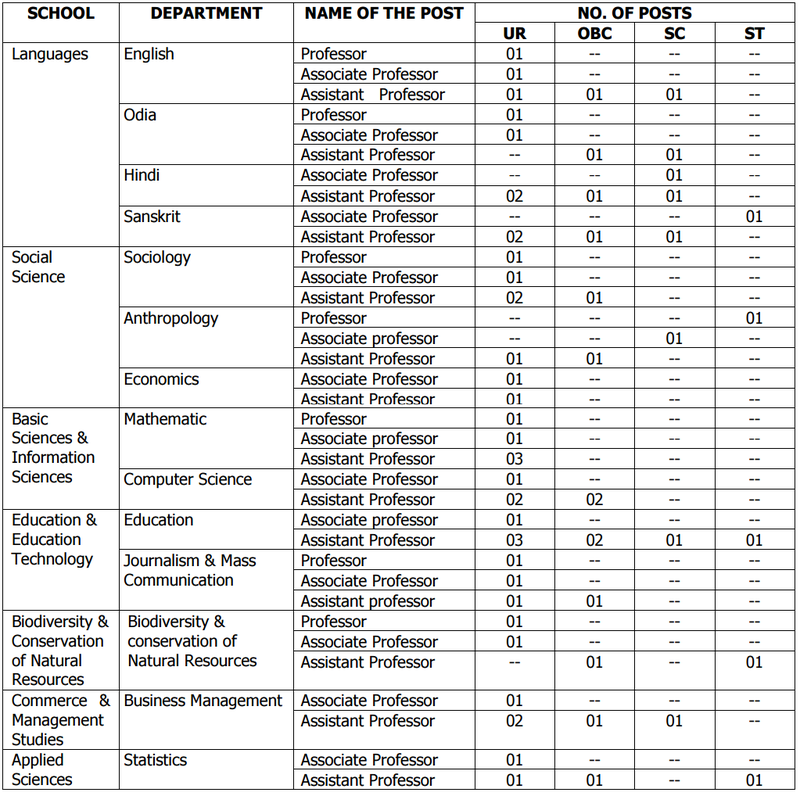 Central University of Orissa, Jobs Notification: Central University of Orissa invited applications from eligible candidates for 65 Faculty Posts. Eligible and Interested candidates can send their application in the prescribed format along with required copies of documents on or before 30 November 2016. (i) An eminent scholar with Ph.D. qualification(s) in the concerned / allied / relevant discipline and published work of high quality, actively engaged in research with evidence of published work with a minimum of 10 publications as books and / or research / policy papers. (ii) A minimum of ten years of teaching experience in University / college, and / or experience in research at the University / National level institutions / industries, including experience of guiding candidates for research at doctoral level. (i) Good academic record with a Ph.D. Degree in the concerned / allied / relevant disciplines. (ii) A Master’s Degree with at least 55% marks (or an equivalent grade in a point scale wherever grading system is followed). (iii) A minimum of eight years of experience. a. A Master’s Degree in Arts / Humanities / Social Sciences / Sciences and M. Ed. each with a minimum of 55% marks (or an equivalent grade in a point scale wherever grading system is followed). OR M.A. (Education) and B.Ed. each with a minimum of 55% marks (or an equivalent grade in a point scale wherever grading system is followed). b. Ph.D in Education; and c. At least eight years of teaching experience in University department of education or College of Education, with a minimum of three years at the M.Ed. level and has published work in the area of his specialization. (i) Consistently good academic record with at least 55% marks (or an equivalent grade in a point scale wherever grading system is followed) in Master’s Degree in Business Management / Administration / in a relevant management related discipline or first class in two years full time PGDM declared equivalent by AIU / recognized by the AICTE / UGC. OR First Class graduate and professionally qualified Charted Accountant / Cost and works Accountant / Company Secretary of the concerned statutory body. (ii) Ph.D. or Fellow of Indian Institute of Management or of an Institute recognized by AICTE and declared equivalent by the AIU. (iii) A minimum of eight years’ experience of teaching / industry / research / professional at managerial level excluding the period spent for obtaining the research degree. (i) Good academic record as defined by the concerned University with at least 55% marks (or an equivalent grade in a point scale wherever grading system is followed) at the Master’s Degree level in a relevant subject from an Indian University, or an equivalent degree from an accredited foreign University. (ii) Besides fulfilling the above qualifications, the candidate must have cleared the National Eligibility Test (NET) conducted by the UGC, CSIR or similar test accredited by the UGC like SLET / SET. A Master’s Degree in Arts / Humanities / Sciences / Commerce and M.Ed. each with a minimum of 55% marks (or equivalent grade in a point scale wherever grading system is followed). OR M.A. (Education) and B.Ed. each with a minimum of 55% marks (or equivalent grade in a point scale wherever grading system is followed). First Class Masters’ Degree in Business Management / Administration / in a relevant management related discipline or first class in two year full time PGDM declared equivalent by AIU / accredited by the AICTE / UGC. OR First Class graduate and professionally qualified Charted Accountant / Cost and Works Accountant / Company Secretary of the concerned statutory bodies. Eligible and Interested candidates can send their application in the prescribed format along with required copies of documents on or before 30 November 2016.